Before jumping into Prototype 2, there’s something you need to know: its opening moments are kind of awful. Where the first game started us off with a fully powered-up Alex Mercer wreaking havoc in Times Square, the second begins with Sgt. James Heller, a revenge-obsessed but otherwise unremarkable soldier on Mercer’s trail, slowly stalking the virus-powered force of mass destruction in an improbable attempt to kill him with a knife. Acting as a glorified tutorial, the game’s first hour or so holds your hand to an embarrassing degree, forcing players through linear tasks designed to teach them about the new powers Mercer gives Heller. This while the starting area (possibly based on Jersey City) is socked in with thick fog. It’s a disappointing, cheap-looking opener, but it’s worth powering through for the freedom and immense potential for fun that comes when the game finally opens up. 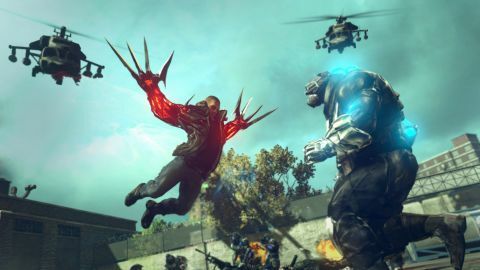 Like the first game, Prototype 2 sets players loose in New York as a near-indestructible superhero/genetically altered horror, where you fight zombies, hulking mutants and a sinister private army called Blackwatch. Blackwatch patrols the city under orders from the even-more-sinister Gentek corporation, which Mercer identifies to Heller as the real bad guys, thereby redirecting Heller’s revenge mission toward them and making most of the game about dismantling their monster-creating operations. Really, though, it’s all an excuse for tearing all around New York City – now expanded from Manhattan (which is now a monster-infested “red zone” and isn’t explored until the game’s final act) to two new, less interesting islands that geographically correspond to Jersey City and Brooklyn – and wreaking as much high-speed havoc as possible against pretty much everyone and everything you see. To make this more interesting, Heller evolves an assortment of powers over the course of the game, most of which involve transforming his arms into really gross-looking weapons. These include a pair of giant claws; a huge, armor-piercing blade; a whiplike tentacle called the Whipfist; a pair of shields that can parry enemy blows and briefly stun them; the Hammerfist, which unleashes devastating blunt-force attacks and can raise spikes out of the ground; and the Tendrils, which – with a charged-up attack – will send tentacles shooting out of enemies in all directions, grab onto whatever’s nearby and then rapidly contract, smashing them with cars, chunks of rubble and other enemies. There’s a similar move called the “Bio-Bomb” that Heller earns later on, which turns humans into tendril grenades, sucking anything nearby into themselves before exploding messily. Throwing one of these into a civilian-crowded sidewalk and witnessing the resultant explosion is nothing short of hilarious, and as much as we’ve used it, it still hasn’t gotten old. As wild and gory as the combat is, though, it comes with its share of problems, mostly related to the somewhat shaky lock-on system. The game can get pretty crowded and chaotic as the action heats up, and it’s sometimes hard to stay focused on the targets you want to hit, thanks to lock-on's tendency to prioritize bigger enemies. This makes it hard to aim at inanimate objects, or to consume humans when your health is dangerously low during boss fights. Heller himself is part of the problem, too, as his powers can be hard to control at high speeds, causing you to overshoot targets, run up walls when you meant to run around them, and tackle distant non-threats instead of, say, the tank you were trying to hijack. There’s more to the game than combat, though, and Heller has a few new, less destructive powers that play a significant role in the sequel. In addition to getting some of Mercer’s best abilities (like gliding and throwing cars) almost right off the bat, he can send out a radar pulse to hunt down certain targets. Using it correctly means getting to high ground, sending out a pulse and watching for where it bounces back from. It’s clumsy at first, but with a little practice, it’s a much more interesting way to track your prey than just following a blip on your map. Description Prototype 2 starts out weak but ends much, much stronger, although its missions and storyline never really rise to a level beyond enjoyable. Even so, its enormously fun as an open-world playground, especially once all of Hellers powers are at your disposal; there are always fun ways to experiment, to cause horrific violence and to watch the hapless pedestrians scatter. If youre looking for an epic, hugely varied adventure, look elsewhere, but if you want a game that lets you run amok in creative, bloody ways, Prototype 2 is pretty incredible.